All scelionid wasps are parasitoids of the eggs of other arthropods, that is, females lay their own eggs within the eggs of other species of insects or spiders. 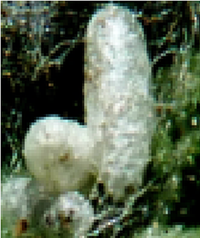 The wasp larva that hatches consumes the contents of the host egg and pupates within it. A wide range of taxa serve as hosts: besides spiders, insect hosts include grasshoppers and crickets (Orthoptera sensu stricto), praying mantids (Mantodea), webspinners (Embiidina), true bugs (Hemiptera: both Heteroptera and Auchenorrhyncha), lacewings (Neuroptera), beetles (Coleoptera), flies (Diptera) and butterflies and moths (Lepidoptera). The host range of individual species and genera varies from those that are specific to one host to those, such as Telenomus, that are known to parasitize species in four different insect orders. Many of the hosts of scelionids are pests of considerable importance in agriculture, forestry, and both human and animal health, for example, the gypsy moth (Lymantria dispar), migratory locust (Locusta migratoria), sunn pest (Eurygaster integriceps), kissing bugs (Triatoma, Rhodnius), and horse flies (Tabanus spp.). A number of species have been used as biological control agents with notable success.